James E. Katz, Ph.D., is chair of the Department of Communication at Rutgers University where he also directs the Center for Mobile Communication Studies. Now that more than 75% of Americans have mobile phones, it is worth asking how this particular technology is affecting the life and vitality of the American family. This question is important not only because families are increasingly communicating and coordinating via mobiles, but also because policymakers are ever more frequently looking to mobile phones to address critical social problems ranging from education to public safety. 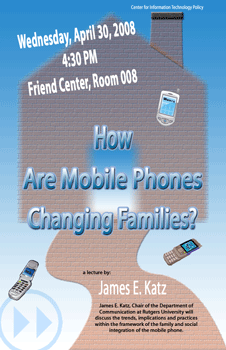 In this talk, I review data from a range of sources including surveys, case studies, interviews and news reports to identify trends in the way mobile phones are used in family life. The implications of these practices are traced for parent-child relationships, social integration, and peer socialization. I also show how the mobile phone fits within the framework of other technologies of contemporary family life such as the Internet and automobile. Finally, based on these usage trends, I will consider the future of family life in the United States under a regime of mobile communication.